How to become a trainer? Welcome to my Indian Balance homepage. You will be able to find information about all important topics and dates around Indian Balance. Please take a look around and discover the world of Indian Balance. Indian Balance reflects a training for strengthening, stretching and awareness which connects the traditional knowledge and rituals of the Native American Indians with modern kinematics. Being with yourself, finding lightness, explore movements, accepting the art of calmness as a gift. Indian Balance sensibly and emotionally opens the path to mindfulness and, at the same time, is a creative awareness training. By utilizing flowing motion sequences that change between tension and relaxation back, belly, legs and bottom are being trained and the whole body is brought into harmony by the implementation of balance techniques. A vast number of variation possibilities of the individual exercises enable people of all age groups and condition types to participate at this program. Awareness instead of perfection – all motion of thinking comes to a hold within inner silence and your heart starts to speak! We can attentively benefit for our resources from the traditional Native Indian knowledge! This is where our integral INDIAN BALANCE® body-mind-soul program applies. We do utilize the huge range of Native Indian motion rituals and energy techniques for all Indian Balance group-, motion and seminar modules; those of the North American Indians as well as those of the South and Central American Indians (traditions of the Inkas and Mayas). 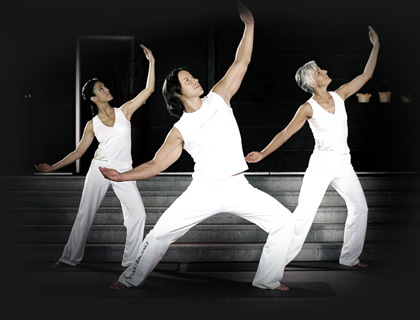 All program levels of the Indian Balance motion world are implemented in a way that every individual technique can be learned and trained by every age group and all condition types. The program can easily be adjusted according to the practitioner’s physical and mental condition. It conveys pleasure and fast success of training. At the same moment, the whole body is being vitalized and the soul being gently regenerated. Native Indian heritage re-activates. Inspired by the cultural heritage of his ancestors and family tradition to the highland Indians, the certified sports therapist Christian de May developed the Native Indian body-mind-soul program INDIAN BALANCE which derives from indigenous energy and motion rituals. In 1912, his great-grandfather founded the first Native Indian school and social mission for the Mapuche Indians in Chile, South America. The fascination of the natural Native Indian way of life – paired with their balanced personality and their cautious body awareness – resembles the two pillars and inspiration to the complete program! The old Native Indian knowledge about the flowing of body energy – in accordance with modern kinematics for all age groups. Indian Balance - "Move you body while your soul rests!" The DVD now makes it even easier for sport and fitness fans to do the training at home.